People are dying from the flu this year, and if you're pregnant, you're at greater risk. The good news? You can get your flu shot anytime during pregnancy. The Centers for Disease Control and Prevention has issued a serious alert involving the influenza virus this year. Though we tend not to fear the flu too much—after all, it's something we've probably all had at some point—the truth is, influenza comes with some serious dangers, especially when you're pregnant, and the 2016 strain seems to be particularly bad. According to the CDC, serious illnesses have been reported—there have even been influenza-related fatalities—and the victims had not been vaccinated. Certain groups are at greater risk when it comes to the influenza virus—and yes, one of those groups is made up of pregnant and postpartum women (you're at greater risk for up to two weeks after you deliver.) This brings us to an important question: Have you had your flu shot for the 2015-16 season? If you answered yes, good for you. If you answered no, well, let's just say we can't stress enough how important it is for your safety, so we're letting an expert put this into words. "Pregnant women can suffer serious complications from the flu," Joyce Gottesfeld, M.D., an OB-GYN at Kaiser Permanente in Colorado told Fit Pregnancy. The complications that can arise are certainly not to be take lightly, either. "Complications can include pneumonia and other serious complications requiring hospital admissions even care in the intensive care unit. 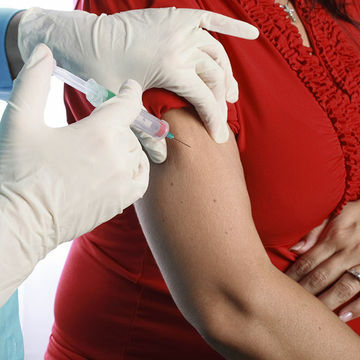 Pregnant women are at an increased risk from dying from influenza," Dr. Gottesfeld said. "Basically, that baby growing below inhibits the mother's ability to fully inflate her lungs and expel air, which makes them more susceptible to any respiratory distress the flu may bring—pneumonia in particular." If this bit of information has you panicking, don't fret, according to Dr. Gottesfeld, you can get your flu shot at any point during pregnancy—it's just incredibly important that you take it and take other precautions to protect yourself as well. "We strongly recommend that all pregnant women be vaccinated, and that they follow other tips for preventing flu—washing hands frequently, eating right and getting plenty of rest, and avoiding crowds, especially [when you're] indoors," she said.